I obviously am teaching the most awesome group of junior mountain bikers around. 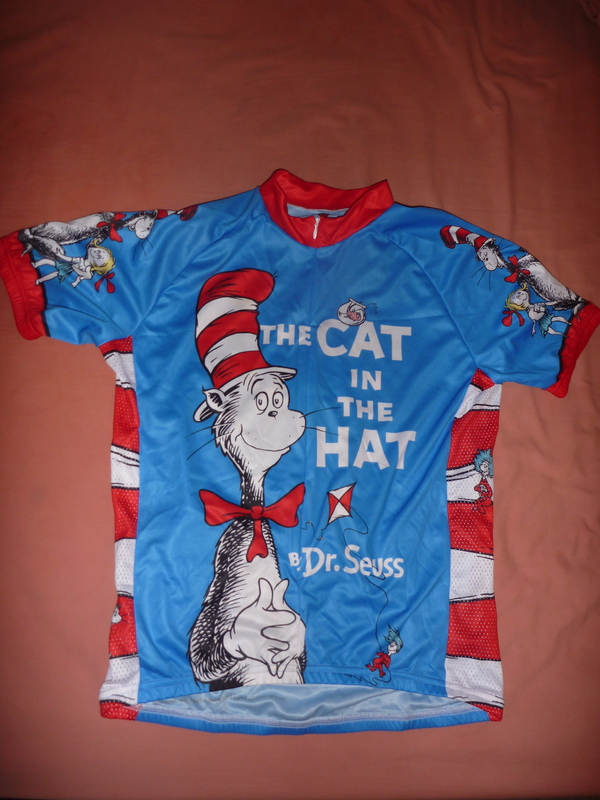 Three of my students had noticed my love of interesting and fun jerseys in the months I was teaching them and for my instruction efforts they gave me this wonderful gift. 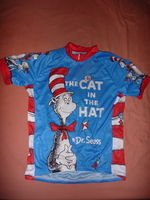 A Dr Seusss cycling jersey, what a truly awesome gift. Thanks Declan, Zoe and Callum. Hopefully your mountain bike skills continue to improve and you continue to love riding your bikes, it is all about having fun on bikes. Fortunately not quite as far out of it or unresponsive as the September 2008 scare however I did have another incident today. Thinking about it in hindsight I can definitely see what I did wrong and some of the things to think more carefully about. 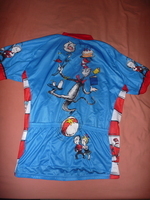 This morning I had the junior mtb skills class I have been instructing, during the class I felt early on my sugar level was a bit high post breakfast and for some reason kept focusing on that for the following hours. However upon finishing the class I did start showing many of the signs of low blood sugar (I think I even commented to one of the parents or to Matt that I thought I had low blood sugar), yet I did not eat anything as I still had in the back of my mind the idea I was high. 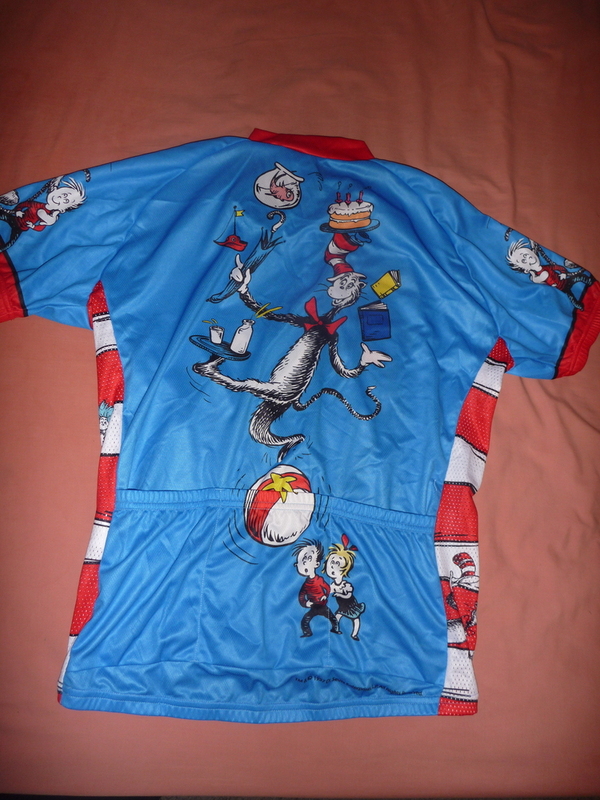 I then rode back toward home via Dickson, stopped in at Maladjusted to say hi to Mal if he was there, he was not and the last thing I really remember is sort of making my way out of the shop and thinking maybe I would have a coffee and cake at my rainbow dreams. The next thing I remember is regaining a good level of conscious thought on the grass next to the shell service station with an Ambulance parked next to me and Ambulance officers looking after me making me eat sugary things. They did not have to inject sugar into me so I was obviously responding enough they could make me eat and consume sugary substances. It seems I rode out of Mals and somehow wobbled through to there, my guess is I fell off and someone kindly rang for an Ambulance when they saw me there. The ambulance station is at Dickson so I imagine the response was fairly fast. This was at about 1pm and I was in at Mals around 12:30pm I think. With enough sugary stuff consumed I quickly got back to a good enough state that I could make my way home. I also went into Mals and asked if they could tell me about my behaviour, they had been trying to convince me to eat and were worried so I was obviously somewhat out of it and vague. The big lesson here was I remember noticing many of the signs of low blood sugar however I continued to ignore them as I had it stuck in my head my sugar level was high from previous signs close to breakfast. I should remember to pay attention at all times and not ignore current signs. Especially under exercise conditions I am well aware sugar levels can change quickly and I was not paying enough attention to that fact. I am lucky I did not hurt myself or come off the bike in traffic and also lucky someone noticed pretty quickly something was wrong and called for an ambulance. Not leaving Canberra or anything quite that drastic, however I am changing jobs. After 10 years of fun in my role as a professional geek (programmer/sys admin) for the School of Computer Science at ANU I am moving on. I have had a great time working at ANU with a lot of good people such as Bob and getting the chance to work with all manner of Linux technology and interesting computing projects. Lots of smart and interesting people to interact with both in my School and elsewhere on campus and the campus itself has been a cool place to be. However I have for a while been wondering if I should look into a change to see what other interesting roles are out there for work. Recently a role for a professional geek appeared at the Australian Sports Commission Bruce Campus (AIS) that looked like it could be interesting, so I applied for the position and after interviews was offered it. I am looking forward to being able to use my IT expertise in the betterment of sports for the nation and it looks like there will be some good projects in the area at the new job. I am not sure how I feel about leaving the ANU but I like the idea of a new challenge and seeing how I deal in a new environment with new people once again. I was surprised and entertained by this happening last week, I had a massive failure of recognition while watching a movie. I guess it stems from a similar problem I had with an Ani concert here in early 2009. Ani had not toured Australia for a really long time previously and I had stopped regularly checking her tour schedule (almost giving up hope that she would tour). When at Christmas 2008 my sister presented me with tickets to go see an Ani concert I was both grateful and amazed, somehow my favourite artist had snuck in an Australian tour I had failed to notice coming up. So to point out why I had such a complete failure in recognition at the movies the other night I should provide some history. Since 1992 or so (when Lethal Weapon 3 was released, then the following year with In the Line of Fire and various following movies) I have been a huge Rene Russo fan. However I knew she had not acted in a movie since 2005 so was not really expecting to see her in any movie coming out in 2011. Thus sitting watching the Kenneth Brannagh does super heroes movie Thor last week I kept staring at the Queen. Thinking wow she is gorgeous, completely eclipsing Natalie Portman in the movie even playing a somewhat small role. However I kept trying to work out who it was, thinking it looks like Rene but assuming there was no chance it was her. Thus when the credits rolled and I saw I really had failed in recognition I was impressed and happy to see her back on screen.